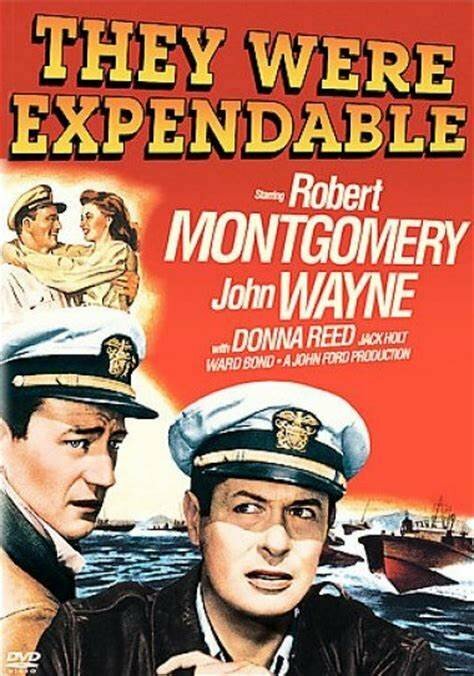 I read that John Ford’s They Were Expendable was liked by the critics but not by the public when it was released. The public thought it was too patriotic and since people were tired of the war, they didn’t care for the movie all that much. While I often share the critics’ view, I must say, not in this case. It isn’t a bad movie, it has quite a few scenes that are good but it didn’t work for me as a whole. At the center of the story are Commander Lt Brickley (Robert Motgomery) and his friend and second in command Lt Ryan Rusty (John Wayne). Brickley is the squadron leader of a crew of PT Boats who are to defend the Philippines just after the Japanese have attacked Pearl Harbor. Although Brickley is the commanding officer, Rusty is still the main character, he is also the one with a love interest (Donna Reed). For once I didn’t mind John Wayne, I would even say this is one of his better movies. Maybe because he isn’t the commanding officer. There is a lot of emphasis on duty and honor and “getting the job done” no matter whether you will come back or not. All that is rather on the annoying side of things but what I truly liked is the battle with the speed boats. These are such neat little boats. Although it is said by an Admiral at the beginning of the movie that these boats were not likely to achieve much, their speed and agility makes them a dangerous opponent for the Japanese fleet and they manage to sink a few very big boats. Their losses are high anyway as they are not only attacked by the Japanese boats but by their planes as well. They Were Expendable was very important for John Ford who was one of those directors (like Capra, Huston and Wyler) who had served during WWII where he also filmed the documentary on the Battle of Midway (1942). He was chief of the Field Photographic Branch of the US Navy and also present during the Normandy invasion in 44 where he met the man who served as model for Lt. Brickley. Funny enough what works best in this movie, apart from the speed boats, is the love story as it underlines how much the people fighting in the Pacific are in danger. The scenes with Donna Reed are quite languorous, I particularly liked the many shots with light falling through blinds. That always creates a nice atmosphere. Something else that I appreciated is the fact that the Japanese are not demonized. They are only present through their planes and boats, we don’t see them. While this is certainly not one of my favourites, I think it is worth watching for those who are interested in the development of the war movie genre. Despite its flaws, John Ford manages to tell the story in a very unique way with a lot of emphasis on all the individual people involved. Last but not least, I think it is a must-see for John Wayne fans as he is more interesting when he gets to play second in command. This entry was posted in Film directors, Pacific, Pearl Harbor, Reviews, True Story, War Movie and tagged Donna Reed, History, John Ford, John Wayne, Movies, Pacific, Pearl Harbor, Philippines, PT Boats, Review, Robert Motgomery, They Were Expendable, Trailer, War Movies, WII. This brings back memories. It was the first movie I reviewed on my blog. I went back and read my review and it was mostly positive. It is fairly accurate historically. Most impressively, it has some twists on cliches that are refreshing. You expect certain things to happen and they don’t. That is amazing for a war movie from that time period. It holds up surprisngly well. I would take issue a bit with your description of Brickley and Ryan as friends. I did not really find that. Their prickly relationship is one of the cool things about the movie. It’s true, it’s not too cliched at all. I wasn’t aware that you reviewed it. But maybe I even saw the review… Not sure. If I haven’t commented then I didn’t. I think they are friends, you can have a prickly relationship with a friend. It’s not a “I’m pouring my heart out” type of relationship, that’s for sure. But you could be right. My review was before we “met”. Back when I was lonely. I haven’t seen this one. Even though my grandfather was such a huge John Wayne fan I could never get into his movies. I’ve seen some of them and liked them, such as True Grit and The Cowboys, I just can’t get into his war movies. Sounds like you didn’t mind him too much in this one. It was funny to see Donna Reed as one of the stars. I always associate her with the Donna Reed show and I forget that she starred in movies as well, including It’s a Wonderful Life. I saw many of his movies when I was a child and liked him then. Especially Hatari was favourite. I wasn’t aware that he was in so many war movies. He is OK in this one and very good in The Longest Day. I bought a huge box with his movies and still try to figure out why the heck I did that. I’ll add Hatari to my list. He has a ton of war movies! How many movies is in the set? At least 15. If not more but only 6 or so war movies, there are a few Westerns too and Hatari! which I need to rewatch. I watched and reviewed The Alamo a few months back and it’s deserving the title of “Most ridiculous dialogue ever”. It’s almost great because it’s so bad. When he is the leading character and takes himself seriously he is awful. Btw Rio Bravo is great. I really liked him in that one. Cool. I added that one too! Hope you will like them. The animals in Hatari are fun. Don’t care for wayne–although there are a couple of exceptions. I have to stand up for the Duke. His body of work does not need to be defended. Yes, there are some bad ones like “The Alamo” but overall he was a great actor and made many memorable war movies and westerns. Rewatch the original “True Grit” where his performance could not be surpassed despite tremendous effort by Jeff Bridges and the Coen brothers. Don’t apologize for owning a Wayne collection – I envy you. List the titles in your Wayne collection and I can tell you which are watchable (most I bet). How can you like Hatari ( a minor Wayne movie ) and assume you won’t like most of his other films? I have a thing for Africa and its animals, that’s all. Thanks a lot, this is great. I’ll follow your advice. Interesting that they are either 4 or 8/9 star movies. At least there are quite a few that should be very good. I seem to remember Red River and think I liked it as much as Rio Bravo. There are as many 4s as 8/9s because when they package those DVD collections they throw in some bad movies to balance the ones you really want to see. Its like when you buy a variety pack of food. They are getting rid of flavors no one wants. I guess you are right. Buggers.